Why Don’t We Have These in The West? Retro Game Bars! More importantly they have a giant Game Boy! So why don’t we have this kind of thing in the west? Maybe we don’t have the geek culture they do in Japan, but I think that enough people would come to one of these if it was in a big enough city, and maybe diversified into board games too? Author OmarPosted on February 6, 2013 Categories Games, RetroTags Board Games, Booze, China Town, Dendo, Game Bar, Game Boy, Game Console, Geek Culture, Giant, Japan, Ku, Kyoto, La Siesta, Map, Osaka Shi, Own Games, Rent, Retro Game, Video Game Consoles, Webdesign1 Comment on Why Don’t We Have These in The West? Retro Game Bars! Stefano Grasselli at Coroflot refers to this as a “Couch” I object to that word so I’m going to call it a “Sofa”. It’s a shame it’s not more Tetrissy, it’s almost like the Tetrisness of the Sofa was added as an after thought. It’s probably more comfortable for that though. I found a GIF of prt this video while browsing Tumblr yesterday, so I had to look it up. While the music isn’t my cup of tea, I like the vector graphics feel of the video, it really reminds me of the hours I spent Playing Spectre VR as a kid on my Pizza Box Mac LC II. 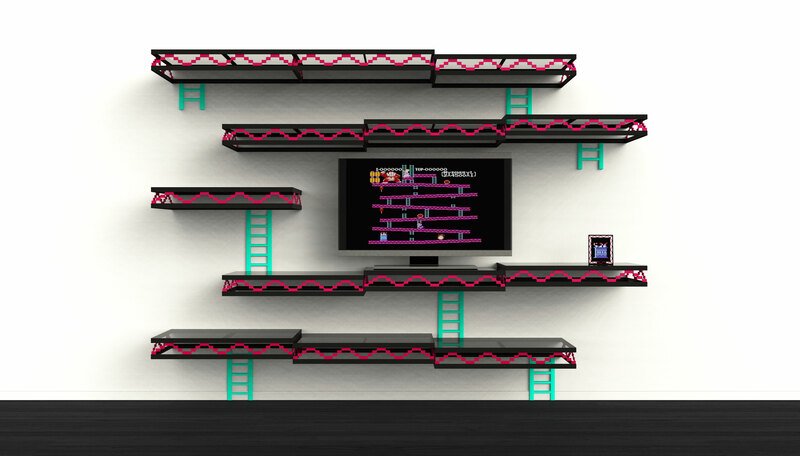 This entertainment unit created by Igor Chak is styled after the level design from Donkey Kong. So one day I was walking around the outskirts of the vintage digital game world “which I sometimes do, please don’t look at me weird”, I came across an old scenario that has been embedded in my childhood memory…The colorful steel beams of Donkey Kong and I started to wonder, what happens to all those video game props when games become old….do they get stored away in a digital world or do they fade away with time? The famous steel beams from Donkey Kong have served their time but I could not pass by such an ingenious design…. So as a designer I though how can I encourage Mario to take this back. I’m sure with popularity of Mario he is not a simple plumber anymore and he wouldn’t want some rusty beat up steel beams at his place but he would probably need some kind of sweet looking wall to put his awards and trophies on. So Mario….sit your Lady friend on that nice looking couch you have and enjoy the show!